Rabbi Berel, born in Antwerp Belgium, studied in Yeshivos in Belgium, Israel, Maryland, Michigan, and New York. He received his Rabbinical Bachelors Degree in 2015, and then moved on to a successful two years of teaching in Baltimore and Detroit. While completing his rabbinical and postgraduate studies, he spent four years leading services, educational seminars, and community outreach Programs in numerous cities across the globe, such as Lithuania, Ukraine, Israel, California, Florida, Oklohama and many more. He has also taught and lectured on an array of subjects such as Talmud, Halacha, and Chassidic philosophy in New York, Michigan and Antwerp. Rochy was born in Brooklyn. She has a degree in special education. She taught in a special needs preschool in Brooklyn and was in charge of The Friendship Circle of Manhattan (an organization which caters to the special needs community). Rochy has also ran many camps throughout the United States. Her loving character and tender approach has endeared her to the many students and campers which she got to know over the years. 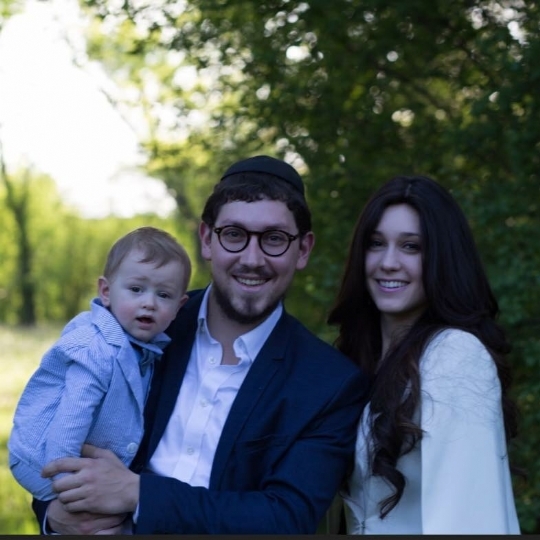 Together with his wife Rochy, and baby Mendel, the Slavatickis moved down to Durham, NH in March of 2018, to offer Jewish Services and programming, all in a welcoming fashion where one is made to feel at home. Growing up in Chabad communities, their passion to inspire and reach out to a fellow Jew is imbedded in them since their childhood. They are seeking to expand Chabad's programs where many more can experience Judaism and its traditions.